Campus sustainability is a holistic enterprise that cannot be accomplished by just one department, organization or office. It is a collaborative effort that relies on support from all academic departments, campus operations and students. 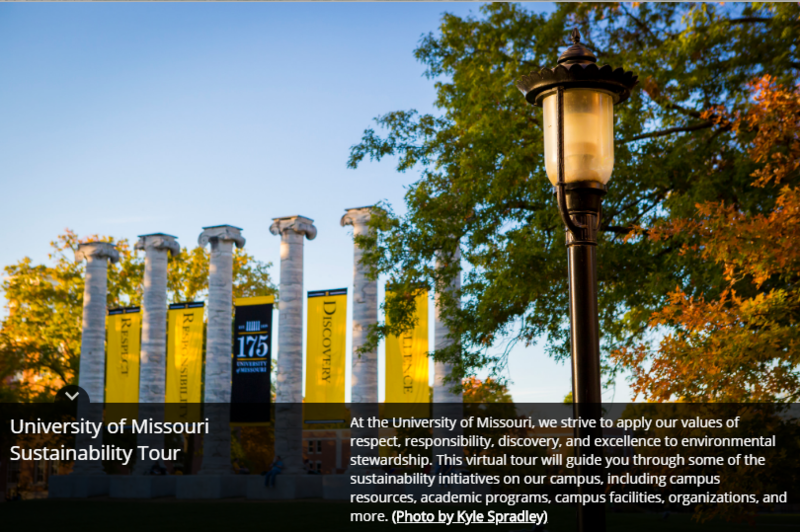 Explore MU sustainability initiatives campus-wide with our interactive map tour. This digital tour was created by Erin Votaw, an Environmental Science senior, as a project through the MU Honors College. Click on the photo above to begin your sustainability tour! The University of Missouri’s Sustainability Office seeks to ingrain sustainability principles of social equity, environmental stewardship and economic prosperity while integrating campus operations, academics and research. Mizzou uses the Sustainability Tracking, Assessment and Rating System to track progress on sustainability on campus. Currently, Mizzou has a Gold rating in STARS. Whether you’re on the hunt for the perfect club/organization or you’re looking for an upcoming event, MU Sustainability has you covered on the Get Involved tab. We offer an event calendar, a list of sustainability focused clubs on campus and a list of sustainability focused organizations within the Columbia community. Stay up-to-date with everything Mizzou and sustainability focused on our news tab. We also have monthly newsletters that showcase a variety of campus opportunities that can help build your volunteer portfolio! MU Sustainability offers a variety of programs for students, staff, faculty and visitors to take part in throughout the school year. Whether students need access to free alternative transportation through our bike share program or community members would like volunteer hours through helping our Tiger Tailgate recycling team, we’re here to help.